I(Jon) first got turned on to hollow wood surfboards, a few years ago when I saw this old guy ripping on a beautiful balsa board. I had never seen anything like it before, it was like he was riding a piece of art, a piece of mother nature, something that was masterfully hand crafted by some ones hands. When I got home I researched and researched these boards, reading all of the forums and learning about Tom Blake and the history of these boards but I never really quite got the sense of what these boards were or what really went into them. 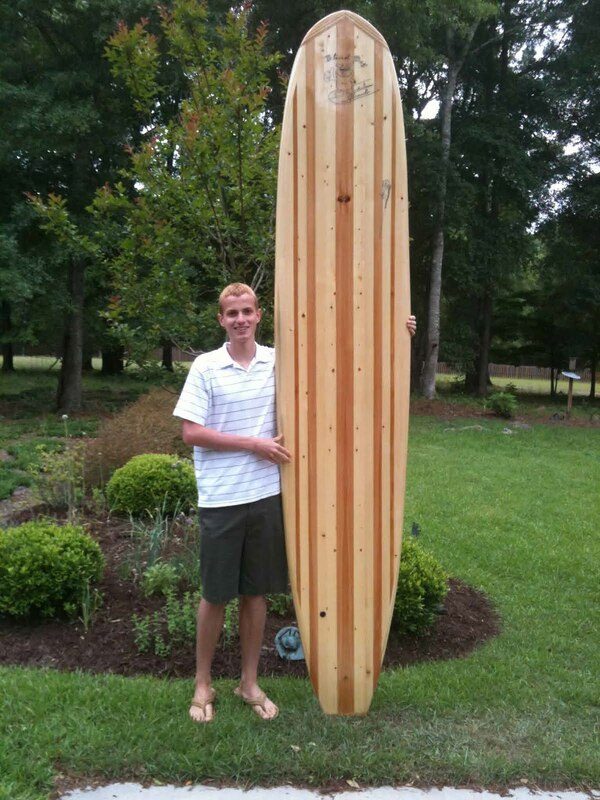 I then happened upon Blind Dog surfboards on the internet, two local guys that happen to be one of the few on the east coast that make these boards. I called them up immediately because I wanted to learn more about these boards, and I needed a new longboard. 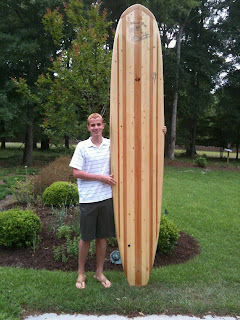 I met Dan Johnson and a few days later my new hollow wood longboard was started. The building of one of these boards in itself is a great journey one that you wouldn't experience with a regular poly board and a regular shaper. Dan kept me updated all throughout the process, informing me of what he was doing and the different techniques being used. To better help me understand and to let me see how one of these boards were built he made me a series of youtube videos of the board being constructed. The day I went to pick up the board, he led me and my father up to his workshop to show me a board in construction and gave us some really interesting information about hollow wood boards and how they are built. Speaking of my board, it was absolutely beautiful the different color woods matched perfectly and glistened brilliantly under the gloss coat of epoxy. Riding the board for the first time was a new experience too, I got to experience knee paddling for the first time, I got looks and glances from other beach goers and surfers as they couldn't keep there eyes off of such a cool board. As far as performance goes, the board was so smooth, it paddled fast and easy and caught waves farther out than I had ever caught before. All the while on my board I get to see my graphics that I drew and he put on there really making the board personalized. I couldn't recommend a better person to make a hollow wood surfboard for you than Dan, he really takes the time to see that you get everything you want, and that everything is perfect. He puts a lot of time and energy into these boards making them that much more special when they are complete. That's a nice board. Quality work. Jon's gonna have fun with that one.